Back in 2008, i was conducting a bunch of penetration testing and as a security consultant i had to document and to explain every findings and vulnerabilities. As you may expected, CVE is the naming identifier to rely on when it comes to describe a vulnerability. However, the more information you provide about your findings the more reliable your report is. So i found myself fighting to aggregate and correlate CVE alongside with other extra information issued from 3rd parties vendors. The idea came then. While the emergence of the Open Standard helped undeniably to shape a new structured way to communicate about vulnerabilities (just take a look at http://measurablesecurity.mitre.org/ to be amazed), i’ve started working on a simple all-in-one xml feed that provides every kind of information related to a certain vulnerability (explicitly CVE id). I called the project vDNA (which means Vulnerability DNA) later renamed to vFeed. vDNA sounds a bit sloppy. vFeed is an Open Source / Open Standard new concept naming scheme that provides extra structured detailed 3rd parties references for a CVE entry. vFeed Core collects the basis xml feed which is generated by a reliable reference (in this case, NVD or CVE) and correlates it across multiple information sources. Here are an example of 3rd parties sources. The concept is depicted in the following scheme. Best solution to get information on vulnerability in an offline environment. 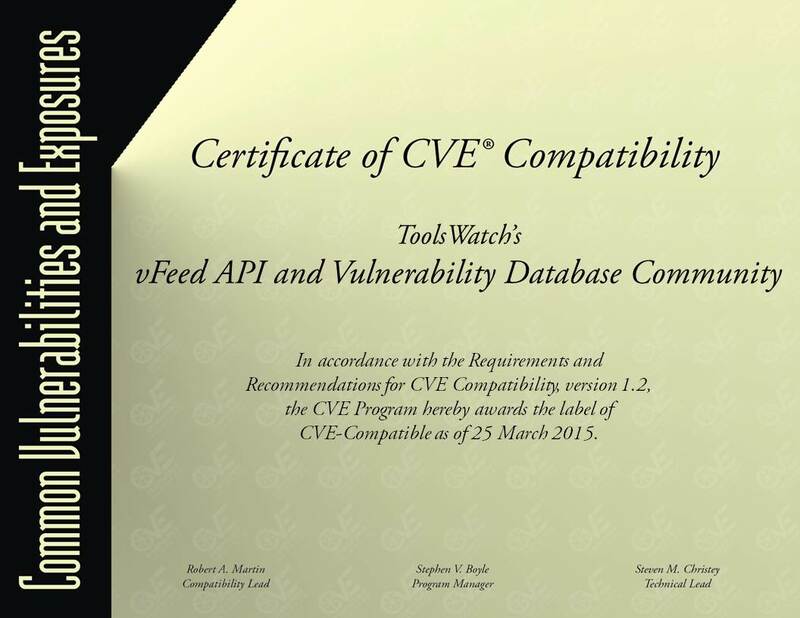 Based on major open standards CVE, CPE, CWE, CVSS..
No SOAP/Web headaches API. vFeed is a fully local database with appropriate python parser to facilite export of CVE vFeed xml. Feel free to contact for any matter related to this project.